Would you like to raise money for Christie's Hospital by attending a charity ball? 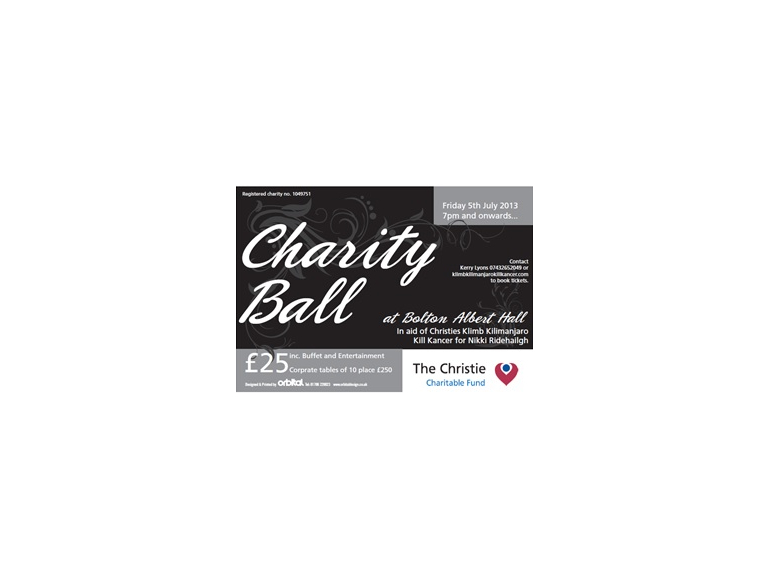 On Friday 5th July, there will be a charity ball at Bolton’s Albert Halls to raise money for cancer charity Christie’s. Sadly, many of us will be affected by cancer at some point in our lives (1 in 3 of us is the latest estimate) so it’s important to raise the money to research a cure for this terrible disease. The ball has been organised after a local lady Nikki Ridehalgh was diagnosed with cancer. Everyone who knows Nikki comments on how fantastic she is. Despite being diagnosed with stage 4 breast cancer, she has a brilliant zest for life, high spirits and astonishing positivity. It’s not the only event Nikki and her “ninjas” are organising to raise funds for the Christie Hospital. Christie’s is one of the best cancer hospitals in the country. Next year the group will be climbing Mount Kilimanjaro in Tanzania. They hope to raise over £30,000 altogether, but are still some way off this target. The dress code is of course black ties and formal. A photographer will be present on the night to take pictures of guests in a studio style environment. The room will look just as beautiful as the guests, as it will be decorated by corporate room decorators. The ball is expected to start around 7pm and finish after midnight. Through the night there’ll be live entertainment, buffet and a DJ so you can dance the night away. Tickets for the evening only cost £25, or £250 for a group of 10. To buy your tickets for this event, contact Kerry Lyons on 07432652049 or visit http://www.klimbkilimanjarokillkancer.com.